Insulin is a hormone that is created by the beta cells of the pancreas—and these cells travel all over the pancreas. The insulin made is released into the blood stream and moves throughout the body. Insulin is an extremely important hormone that supports many things for the body. Insulin mostly regulates your metabolism’s ability to break down carbohydrates (sugars and starches), lipids (fats), and proteins, as well as regulates the functions of the body’s cells, including their growth. Insulin is crucial for the body’s use of glucose as energy. Insulin resistance (IR) is a condition in which the body’s cells start to oppose the effects of insulin—the normal response to a given amount of insulin is reduced. When this happens, higher levels of insulin are required in order to compensate, which forces your pancreas secrete more insulin. The pancreas will start to make more and more insulin until it can no longer produce enough for the body’s demands causing high levels of blood sugar. If left untreated, insulin resistance can lead to the development of diabetes and heart disease. *Insulin resistance can be linked to other medical conditions including fatty liver, arteriosclerosis, skin tags, and reproductive abnormalities in women. *People are more likely to have insulin resistance if obese. Diabetes is a metabolic disease in which the body’s inability to make any or enough insulin causes higher levels of glucose in the blood, and is typically a lifelong (chronic) condition. Approximately 8.5 percent (25.8 million) of the United States population has either type one or type 2 diabetes—and around 79 million people have pre-diabetes (insulin resistance). With Type 1 Diabetes the body is not able to make enough insulin. Sometimes, this type of diabetes is known as insulin-dependent diabetes, juvenile diabetes, or early-onset diabetes. Patients typically develop Type 1 Diabetes before their 40th birthday—most often in early adulthood or teenage years. Type 1 Diabetes is not as common as Type 2 Diabetes, with around 10 percent of all diabetes cases being Type 1. Patients who have Type 1 Diabetes need to take insulin injections one or more times a day for the rest of their lives, and need to be very aware of proper blood-glucose levels. Patients with Type 1 Diabetes need to follow a special diet and exercise programs to ensure a healthy blood-glucose balance. 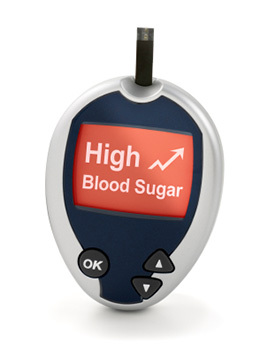 Around 90 percent of all diabetes cases worldwide are Type 2 diabetes. Their body is not able to utilize the insulin it produces (insulin resistance). Some patients are able to control their Type 2 Diabetes symptoms by losing weight, creating healthy diet plans, exercising regularly, and monitoring their blood glucose levels. People who are overweight or obese have a much higher risk of developing type 2 diabetes in comparison with those who have a healthy body weight—and those whose body hold visceral fat (known as central obesity) are especially at risk. Being overweight, physically inactive, and choosing the wrong foods to eat all play a role in the development of Type 2 Diabetes. In fact, drinking just one can of (non-diet) soda every day can raise your risk of developing Type 2 Diabetes by 22 percent and even more frightening is that diet sodas can increase the risk of diabetes even more than sugar-sweetened sodas. The American Journal of Clinical Nutrition published a study that discovered woman who drank just one can of diet soda had a 33 percent increased risk of developing type 2 diabetes. The risk of developing Type 2 Diabetes can also increase with age—so it important to maintain a healthy diet and get plenty of exercise throughout your entire life. Lifestyle counseling focuses on helping patients with diabetes adopt healthier eating habits and boost their physical activity because it helps improve blood glucose, blood pressure, and cholesterol levels. Research has shown that patients who receive face-to-face lifestyle counseling at least once a month lowered their A1C to less than 7 percent in about 4 months, while those who receive counseling less than once every 6 months took 23 months to get their A1Cs to decrease. Patients who actively receive lifestyle counseling achieve their health goals much faster than those receiving less frequent care. Call our office today if you have any questions about diabetes or lifestyle counseling.